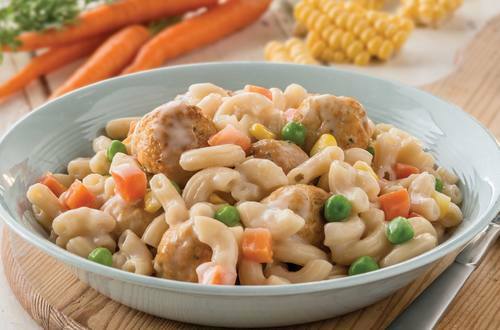 Create a quick and easy dinner for the whole family with our chicken meatballs recipe with macaroni, part of the Continental recipes collection. Serves 3-4. 1 Mix chicken mince and egg in a bowl and form into 24 small meatballs. Heat olive oil and brown meatballs until almost cooked. Remove from pan and set aside. 3 Return meatballs to the pan and stir through frozen vegetables a few minutes before the end of cooking.